Welcome to KPB Recruiting 101, the newest section of the KPB website! We’ve moved this resource from it’s original location at www.KPBrecruiting101.org to our main site so that you can get all the recruiting help you need in one place. The location may have moved, but the content is better than ever and if you want to play college baseball, you’ve come to the right place! The goal of the Recruiting 101 section of the website is to help guide you through the recruiting process from start to finish in a chronological format. 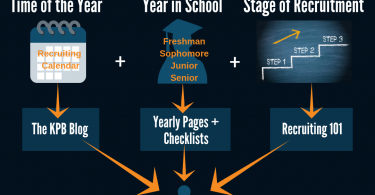 While the yearly pages and checklists provide a general overview of what you should do during each year of high school to move toward your goal of playing college baseball and the blog sends provides information at relevant times during the recruiting calendar, Recruiting 101 is unique in providing guidance for exactly where you are in the process of finding a college program. If you are just starting to explore the idea of playing college baseball, we have information specifically to help you. If you are trying to decide where you should commit, we have that information and the steps to take afterwords all ready just for you! Recruiting 101 is built on the premise that the recruiting process is best broken into more digestible steps. 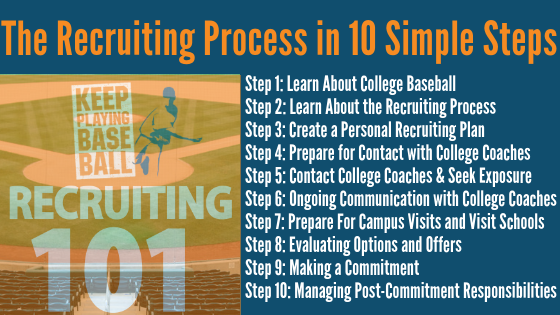 While every recruitment is different, all successful recruiting journeys have 10 major steps or phases in common. 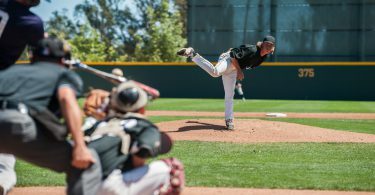 Recruiting 101 will walk you through these 10 major phases on your way to becoming a college baseball player, giving you lots of information and guidance each step of the way. 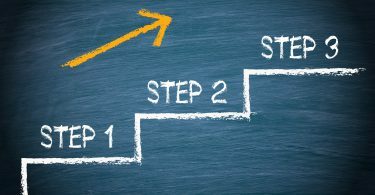 During each individual step, Recruiting 101 will help you figure out what you need to learn, what you need to do, and what comes next. With KPB’s help, you can take control of your recruitment, find a program that fits your unique needs as a student-athlete, save money, and enjoy the process as you do it. We are excited to help you on your journey. We’ll provide you with the information, resources, and encouragement you need, but the hard work and perseverance required to make it to college baseball is up to you! You must put in the time and effort to improve as a player and find a college fit. We’ll never make any guarantees about your ability to play at your dream school or even at any college program at all. What we can promise you is that our information, which comes directly from current and former college coaches and players, is as good as any you’ll find out there. The main difference you]ll notice with our resources is that everything is 100% free! Our goal is to make the college baseball recruiting process affordable for anyone who has the desire to play at the college level. There’s lots to do, so let’s get to work!